So on the Tuesday, we went to our second cardiology appointment. Recalling how Professor Marshall had been happy to consider surgical options even in the most dire of situations last time, we were hopeful that he would remain open to considering these and other relevant treatments. However, we also knew that offering active treatment for babies with trisomy 18 was not usual practice in the UK, and we weren't sure whether the diagnosis would change his approach. 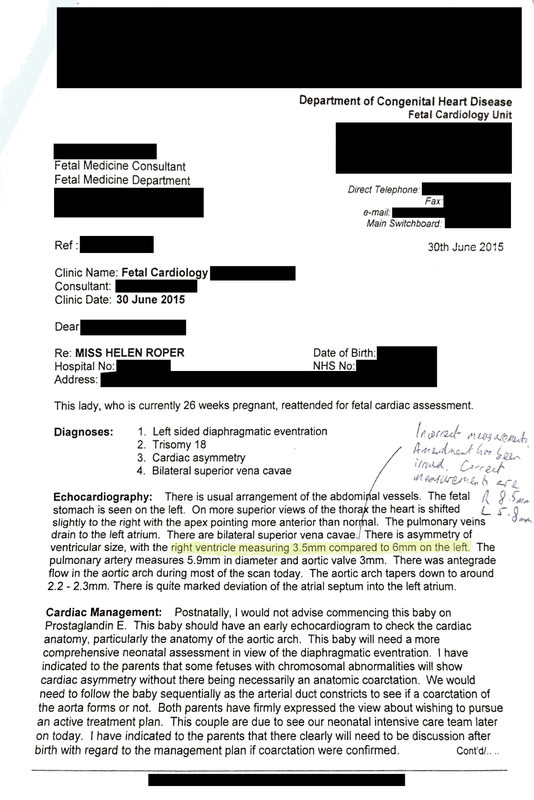 It was the same junior doctor performing the scan as before (Dr Cook), and he had with him a visiting cardiologist. This was the first cardiology appointment after our trisomy 18 diagnosis and I think they weren't quite sure why we were there. The scan was very quiet, as usual: they don't talk during echo scans and actually they're fairly good at not giving away what they're thinking (however, I've never had a ‘normal’ echo, so I can't be sure). After a while, Professor Marshall joined us in the room and the three cardiologists examined the images and talked quietly among themselves. Professor Marshall pointed something on the screen out to the visiting cardiologist every now and then. After a while, we were done. We were again invited into the quiet room where June Winter (the cardiac liaison nurse) waited. This time, neither Dr Cook nor the visiting cardiologist joined us. 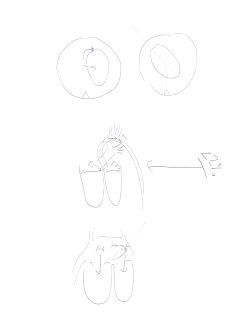 Professor Marshall opened the conversation by describing the current presentation of Rumer's heart with his usual sketches. It was better news than expected! 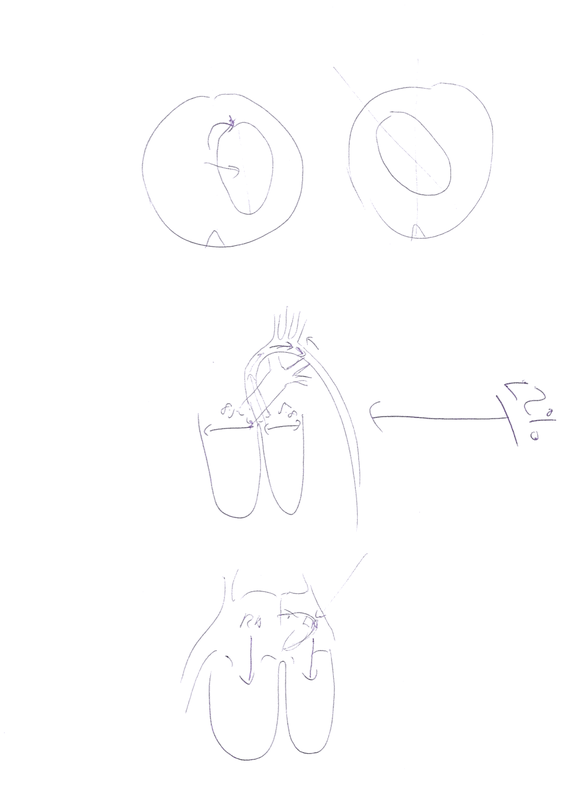 Rumer's heart remained shifted to the right, but the relative sizes of the ventricles had evened up a bit: the right ventricle now measured 8.5mm, and the left 5.8mm. This likely excluded the diagnosis of Hypoplastic Left Heart. The flow through the aortic arch was now only intermittently retrograde; blood was predominantly flowing the right way around the arch now. The possibility of a coarctation of the aorta remained, but this seemed like a minor issue compared to the complexities of the last scan. However, Professor Marshall opened the conversation by saying that they wouldn't do anything at birth. This of course was utterly unacceptable to us. By this time, we had begun dabbling in the cardiac trisomy 18 research papers and knew that babies with trisomy 18 did have cardiac surgery and that post-operative mortality was not unacceptably high, although we did not yet have a firm grasp of the research. We objected strongly, and he clarified that he meant that there would be no crisis at birth that would require immediate intervention. So no need at that stage for Prostaglandin E to keep the duct open. He explained that we could monitor Rumer closely after birth and watch as the duct started to close, to see if a genuine coarctation developed. I still wonder to this day whether his initial statement was to do with the trisomy 18, or whether it was, as he said, a slightly ambiguous way of putting the standard care plan. We asked him what they would do if there was a genuine coarctation. He stated that the hospital had no policy against surgery for a baby with trisomy 18; he said that in fact this was a deliberate choice, as they wanted to provide individualised care to each child according to their clinical presentation rather than having a set rule. This felt promising but also concerning, in that we had already realised by this time that individualised care could be used as a euphemism for ‘whatever care we want to do’. Evan Marshall, however, was happy to discuss the possible surgical approaches to a coarctation of the aorta: when they would be used and their relative risks and associated mortality. We felt at this point that he was treating Rumer as he would any other baby. However, when we again clarified whether the trisomy 18 would make any difference, he said that it would be discussed in the same way that the cardiac team discussed any other case at their meetings: they would consider Rumer's clinical condition. However, he added that surgeons are not obliged to perform any surgery that they consider ‘futile’. 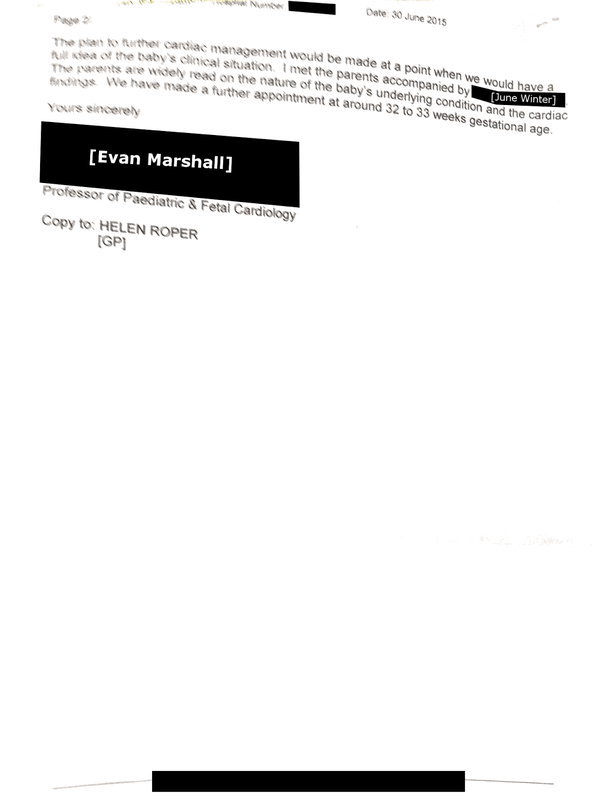 This concerned us, since although we considered a characterisation of a particular treatment as futile as meaning that it wouldn't be successful, we realised that it would be possible to describe almost any treatment for babies with trisomy 18 as futile, given that even those without serious cardiac problems are likely to have an extremely limited lifespan. We probed a bit to try and pin him down, but he was unable to offer any further clarification on the concept of futility. We left the appointment feeling none too sure about cardiology. Would they operate (should it be necessary)? Would they refuse? Did the lack of commitment indicate that we were being fobbed off, or just uncertainty, or simply, as they indicated, an inability to discuss what they would do until Rumer's clinical condition became apparent after birth? We felt unsure, but we liked Evan Marshall – we felt that there was some support there, and at least he hadn't written off any possibility of treatment for Rumer. It felt like a good start as we hoped for a neonatal appointment quite soon. We were also pleased that Professor Marshall had been very happy to make another appointment with us a few weeks later, so as well as finding out how Rumer's heart progressed, we would have the opportunity to explore these issues further. However, we did feel that a standoff around cardiac surgery was reasonably likely to arise, and we thought to each other that perhaps we ought to find a solicitor who specialised in these matters in order to try and determine what the legal situation was. We came back home to the delivery of Rumer's first clothes. We'd bought them in case of an early stillbirth, and they were tiny. We hoped we would never use them, and of course we never did. The next day we were waiting for the delivery of a sofa-bed (a friend had been going to come and stay but cancelled once all the issues arose) and the following day we had a fetal medicine appointment and were planning to chase that neonatal appointment. We didn't know then that this week would be the beginning of a long fight!